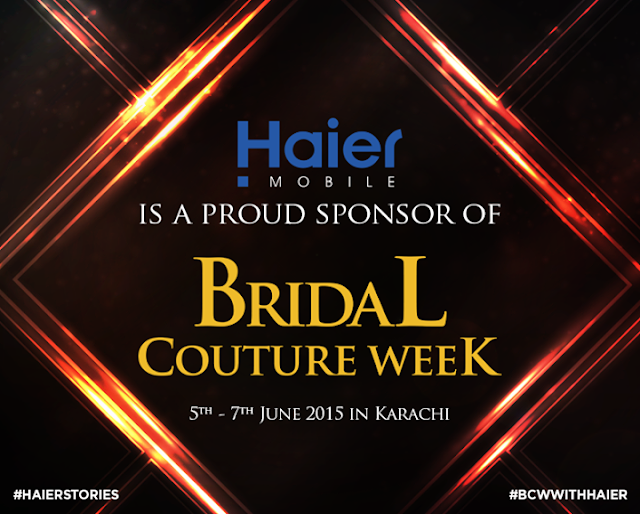 Bridal Couture Week 2015 with Haier!! For the first time in Pakistan, a mobile brand has taken a step into the fashion world; this year Haier Mobile is one of the major sponsors of Bridal Couture Week 2015 along with HUM Network and Telenor. To all attending BCW, there will be an exclusive media lounge by Haier Mobile, where they will be displaying their Esteem Series. Haier Mobile has surprise planned for Best Designer & Model as well. This season’s Bridal Couture Week will feature 24 fashion designers and 45 outstanding male & female models. Acclaimed actors and actresses to walk the ramp include Urwa Hocane, Mehwish Hayat, Ahsan Khan and Aijaz Aslam. The creative team behind the high profile fashion event includes :Sabs the Salon - hair and makeup maestros.Take-II - PR management. Hassan Sheheryar Yasin - event director. Stay tuned to my Social media for the updates on TBCW2015! !